Do you wish to attend the programs organized by the renowned US universities such as Brown University and The University of Maryland, College Park? You have a great chance here! The call for applications opens NOW! The Lee Hysan Scholarship for Global Leadership and Civic Engagement (GLCE) Exchange Programme 2019 is funded by the Lee Hysan Foundation. 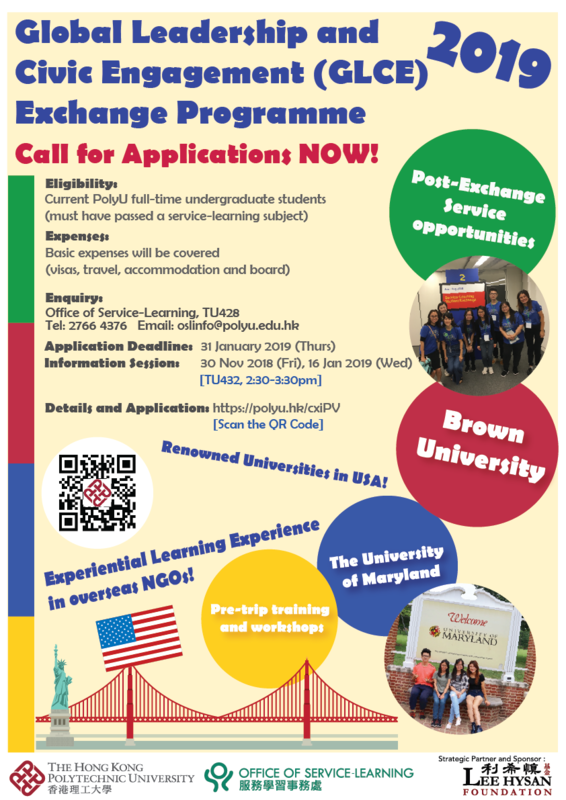 It aims to provide support for PolyU students to engage in service-learning (SL) exchange or internship at a recognized overseas university so as to develop students’ global citizenship, broaden their perspective on SL and nurture motivated students to become SL Leaders and Ambassadors. Basic expenses will be covered (visas, travel, accommodation and board). Please complete the online form and the application forms (both PDF and Word). Then, upload the completed application forms in the online form. There’re instructions to guide you on uploading the required documents in the online form.